John shares Jesus teaching the people about life and salvation. 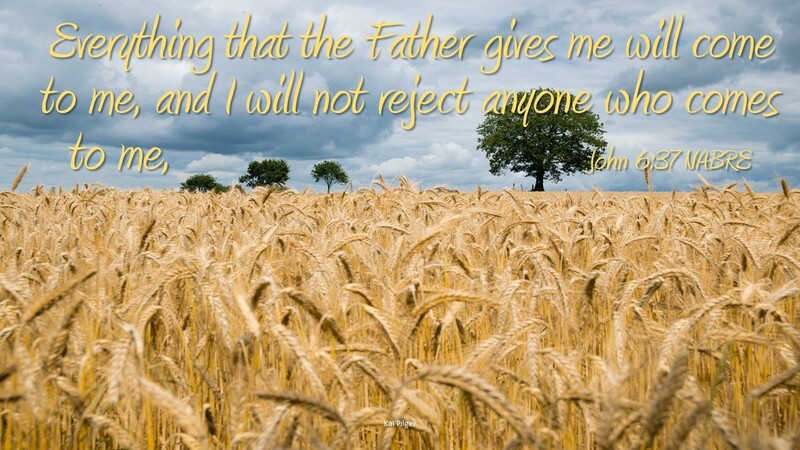 Jesus tells those listening, “I am the bread of life: whoever comes to me will never hunger and whoever believes in me will never thirst.” (John 6:35) As the bread of life Jesus is the Father’s gift, who gives sustenance and eternal life. Jesus is speaking about a life of the spirit, an inner life that can only be nourished by Jesus. He is that bread that will deepen our inner life and we must take Jesus in to be nourished. But Jesus goes on to say that the people do not believe him, they see who he is and they do not accept Him. But this does not seem to concern Jesus. He leaves the business of people believing to the Father as he says, whoever the Father sends to Him will come. The Father works on people’s hearts, moving them to have faith in Jesus. To come to Jesus means you believe in Him. Believing in Jesus is not an intellectual exercise, Jesus is talking about a ingesting, having an insatiable desire for Jesus that you must take in deep in your gut to be satisfied, taking Him until you can’t take anymore (which is never.) This is the message Jesus wants us to understand about believing. You must be willing to consume Jesus, so much in fact that you are consumed by Jesus. And Jesus says if you do come and you do believe, he rejects no one. How do we demonstrate belief? By our actions. If we believe in Jesus we strive to be like Jesus, we love others, serve others, and offer what we have for others. It is when you see somebody hungry, feed them. You feed them because you believe in Jesus and know this is what He would do. You are coming to Jesus. Do you desire Jesus deep in your gut? Can you satisfy your hunger for Jesus without sacrifice?